The first male supermodel, Yogi Cameron Alborzian left the world of high fashion to transform his life through the study and practice of Ayurveda. What he learned changed his life, and, after years of study, he now works with everyone from Hollywood celebrities to executives of international corporations to bring balance, improved health, and inner peace to their busy lives. He is the author of The Guru in You: A Personalized Program for Rejuvenating Your Body and Soul (HarperOne), a book that provides readers with methods to live healthier, greener, more spiritual lives in accordance with the Ayurvedic and yogic path. In his latest book, The One Plan (HarperOne), Alborzian offers an alternative to the typical New Year's Resolution diet gimmicks. Based on texts written more than 2,000 years ago by the Indian sage Patanjali, and now known as The Yoga Sutras, Alborzian's book offers a 52-week plan that incorporates these ancient teachings into a modern practice that will help readers lead healthier and more balanced lives. In his talks, Alborzian invites audiences to embark on a journey to connect with their bodies and discover their natural ability to heal. By developing a practice that works for our individual needs, we can forever improve how we eat, sleep, work, and exercise. He presents his clients and audiences with a variety of Ayurvedic and yogic therapies, diet guidance, and herbal remedies to both treat specific conditions as well as set them on a path to greater mental, physical, and spiritual health. 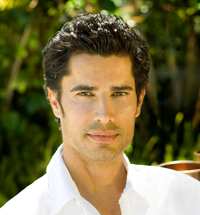 Alborzian has had recurring appearances on The Dr. Oz Show, The Ellen DeGeneres Show, the Today Show, E!, and Extra. He has also been featured inElle, the New York Times, and Men's Journal. He also works as a goodwill ambassador to the State of Kerala in the South of India where the tradition of Ayurveda and Yoga began. He lives in Los Angeles. "It doesn't matter who you are - there's something for you in this book." "One of the most sought-after people in holistic medicine." "With his common sense approach and Ayurevedic teachings, Cameron Alborzian has an effortless way of positively changing your life. Thanks to Cameron, my days are calmer, more enjoyable, and less stressful. If you really want to make a change in your life, gain health in body and mind, read Cameron's book. He's improved my life and I hope you allow him to improve yours." 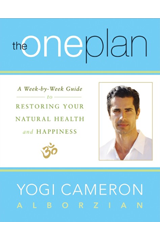 "Yogi Cameron is a wonderful teacher who can help all of us make conscious choices about our health and well-being." "The Guru in You will gently guide you to a more conscious and meaningful life. I am impressed and inspired by Cameron's profound wisdom. He'll teach you how to lead a nourishing life by making wellness part of the superstar you truly are." "The young Cameron Alborzian who came to train to become a yoga instructor at the NY Integral Yoga Institute has evolved into a master teacher of yoga and Ayurveda. His story of the journey is informative and fascinating." "Cameron's journey has brought him down many paths, but the path that he has chosen, and the path that he walks is truly one that is spiritually elevating. This book and his life's work is a map of the journey." "Cameron Alborzian's ability as a therapist is not in question. It was an intense experience. Months on I still feel Alborzian's steadying influence and take his advice pretty seriously. I am considerably happier. That is down to his skill as a therapist and his inner calm..."
"Are you stressed, flighty, tightly wound, gluttonous, incapable of concentrating, sleeping, or just saying no? Cameron Alborzian has been there, in his previous life as a globe-trotting model. Now, in his most recent incarnation as author of The Guru in You, the famously chiseled yogi helps readers curb the excess that can lead to suffering, not to mention unwanted pounds."